Hey guys. Just bought a 93 Honda Accord with the F22A1 motor and the previous owner was incompetent in upkeep on the car. Just recently the car started to reach pretty high temp on the gauge. Thankfully I was only about half a mile from the house when it happened. I parked it and popped the hood. I noticed coolant all on the underside of the hood. At closer inspection I noticed it had sprayed out of what appears to be where the head gasket is. It blew out near the fuel rail. I talked with my trusted mechanic and he said it's most likely a bad gasket. He quoted me a price for him to replace it and it's far outside of my budget and I'm being forced to buy the gasket. Coolant. And engine oil and will have to replace it in my yard. I know that once I get the head off that it'll need to be shaved. My only problem is I only know enough about cars to get myself into trouble. Is there a detailed step by step guide with pictures somewhere out there, or perhaps a shop manual? If so could you guys be so kind as to link it in a reply? I have limited time (until monday morning) to get this done so any and all help would be greatly appreciated. I'd want to be sure it was the head gasket before "going in". There are all kinds of coolant hoses running around under there. Once cool, top off the coolant and verify the source of the leak. Suggest performing a cold pressurized cooling system test to confirm leak location. Check w/ auto parts stores for a rental tool w/ proper fittings for your Accord. OK so I filled the radiator up with coolant and to be amazement and happiness. The head gasket is fine. It is indeed a cracked hose. The hose leak is fairly small but I can see how it'll get worse with pressure build up. I have taken a picture of the hose that needs to be replaced. Here it is in the first picture. It's below something that I don't know what it is. I'm guessing it's possibly a fuel pump? Let me know. The unknown peice im referring to is the shiny piece in the middle of the second picture. I'd love to get my car up and running before Monday morning so I can get to work. I can't make out where or what hose is leaking by the pictures. Can you remove the hose and take it to the local parts store and have them match it up. Everything is good to go. 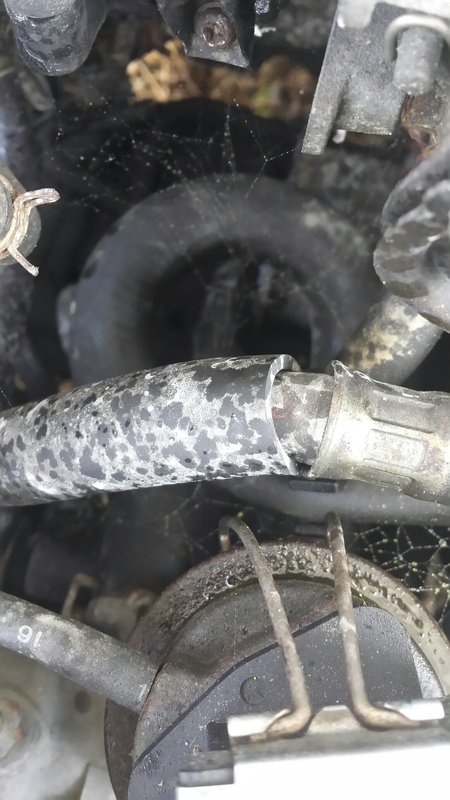 I went to advanced auto and replaced the hose myself. It was the bypass hose that was bad. I had to remove the damn intake. The erv. And something else just to be able to get to it. But it's good to go now. Although. My check engine light is on and won't reset when I leave the battery unplugged AND strangest of all. The spark plug wells somehow got flooded with oil and I had to take out the plugs and dry em off before it would fire again. Any idea on what could cause the check engine light and the spark plug wells getting flooded? Check for the codes....there is a "blue" connector on the pass side under the glove box that does not connect to anything....just a two pin female connector. You have to use a paper clip or piece of wire to "jump" or connect those two pins/wires together. You then turn the key to "on"/pos II - like where it would be when the engine is running/ The CEL should come on for a few seconds, go off, then start flashing. There are long and short flashes....long means ten, short means 1's...four long, three short is a code 43. Now if there are multiple codes there will be a pause between them. If you can take a video of the flashes we could help with getting the numbers. 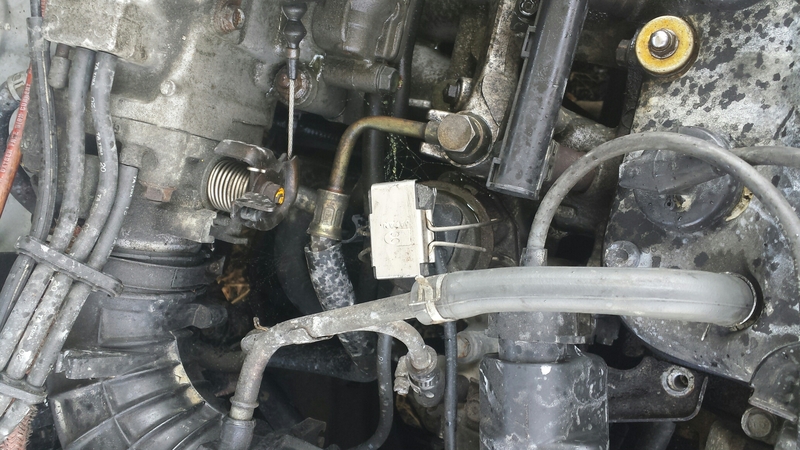 Oil in the spark plug tubes is a pretty common issue with these. The issue is that there are two sets of seals/o-rings that seal those tubes. The upper seals are between the valve cover and the top of the tubes - pretty easy to replace those. The lower seals are under the "cam/rockers" - to get to them you have to remove the timing belt from the cam gear and then remove the "cam/rockers". OK well the code come out to be a 12 which I did a little digging and that's a fault code for the EGR valve, which I had to remove yesterday so I could get the bypass hose replaced. Any way you know how to flash the computer without an OBD1 hookup? It would be greatly appreciated. Thanks. Not sure what you mean by "flash" but to clear the codes on an OBD-I set up you just need to remove power from the ECU for a few minutes. Me, simple to full the fuse - in the under hood fuse box on the pass side of the car - for the ecu. EDIT - or you can remove the ground cable from the battery for a minute or so. With coolant going everywhere under and around the egr valve.....possible it got into the "lift" part of the valve and caused the fault. I would suggest that you bleed the air from the cooling system, air in the system will cause strange things....bouncing idle issues and more. Not sure "how far" you want to go....but at least turn the heat to max. Then there is a bleeder screw on the thermostat housing where the lower hose connects...just to the left/pass side of where the egr is. Open the bleeder and SLOWLY add coolant until a steady stream comes out of the bleeder. Close the bleeder, top off the rad, replace the cap, top off the overflow bottle. 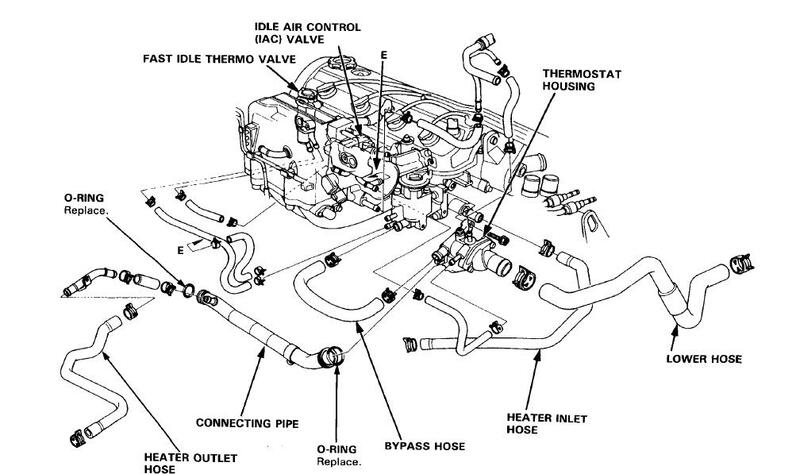 Start the car and let it run for 20~30 minutes at idle....or until you hear/see the cooling fans come on and go off. Of course keep an eye on the temp gauge and shut it off if it gets anywhere near 3/4.....And at the end, set the heat **** back to where you want it. Hope for the best. There are more detailed information on bleeding the coolant system that we can get into if the "simple/quick" method does not work.